Note: This feature may not be available in your plan. Please contact your Advocacy Coach to learn more. There are two possible configurations for OAuth2 depending on the experience you'd like for the advocate sign in / sign up flow. OAuth2 Single Sign-On: OAuth2 is the only option for sign in / sign up to your Hub. In this configuration, advocates are directed to your sign in page upon entering the Hub - bypassing the default AdvocateHub sign-in options. Both of these options have the same setup process, but Option 2 requires an additional configuration step. For a more detailed look at how these flows look to your Advocate's, check out our OAuth2 FAQ article. To find the OAuth 2 configuration area, click on your name in the top right corner of Admin View and click on Integrations. Below are the steps to configure the OAuth 2. 3. Provide the URL path to find the Token, Authorization, and where to fetch the user's information (you may need to provide configure a scope to gain access to the user's email address). After completing the steps above, you can now proceed with Option 2 as mentioned in the introduction. That is, bypass the AdvocateHub login system and present OAuth 2 as the only login option for your Hub. 2. 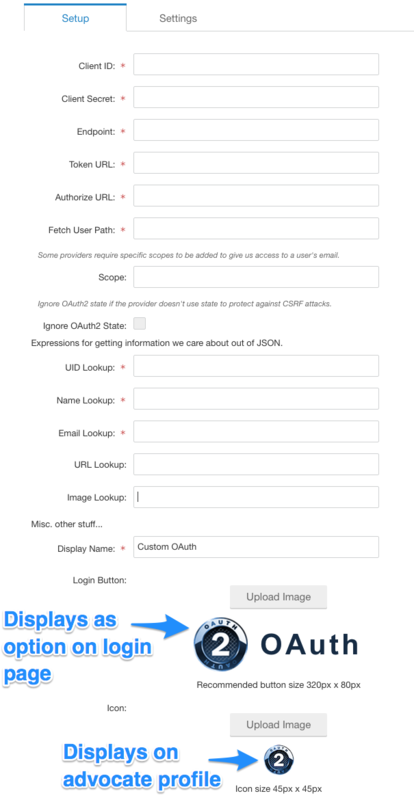 In the Single Sign-On section, choose the Enable option, and select OAuth. 3. Save your changes and you're good to go. OAuth is now the only way advocates can enter your Hub.